Don’t Let Your Machines End Up Like This! 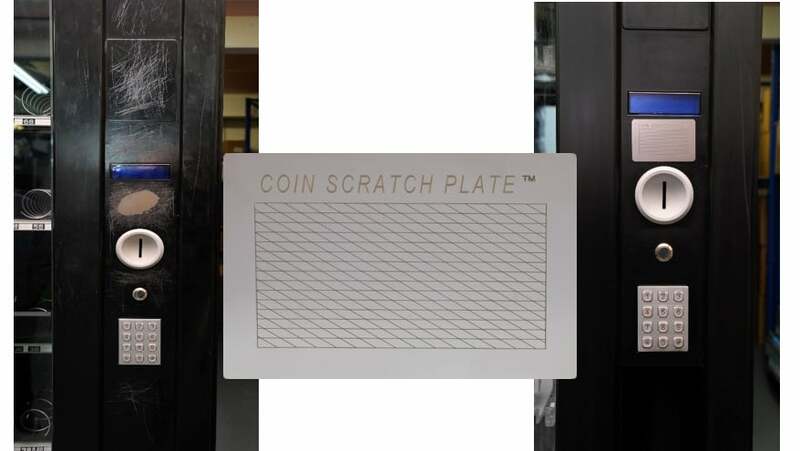 Made from high grade bright stainless steel, laser engraved and just 1mm thick the coin scratch plate measures 76mm width by 50mm high, the new larger coinrub measures 70mm width by 103mm high. They are simple to fit – just peel off of the protective film on the back and stick on. High bond double sided weatherproof permanent tape with a seamless bond. The plate can also be supplied predrilled for pop riveting if required. Protect your machine and prevent coin scratching damage in the first place – it is that simple. Fit a COIN SCRATCH PLATE™ for just £6.95 or the larger COINRUB™ plate for just £8.95 + vat each & p&p and you will save yourself time and money in the long term. If you order 200 or more we can laser engrave your company name, telephone number or website on each plate for free. Discount available on volume orders.